The METOLIGHT LED tube VDE-RM is significantly brighter than conventional fluorescent tube 90 cm / 30 Watt - T8 - saves about 80% energy at about 10 times longer durability. The Asmetec SCE-technology ensures that there is no power creep voltage from one end of the tube to the other. The matted shell ensures anti glare lighting in light beam angle of about 140°. The optimal mounting height is from 2 - 4 m.
Rewiring of the luminaire or even remove the existing magnetic ballasts is not necessary. 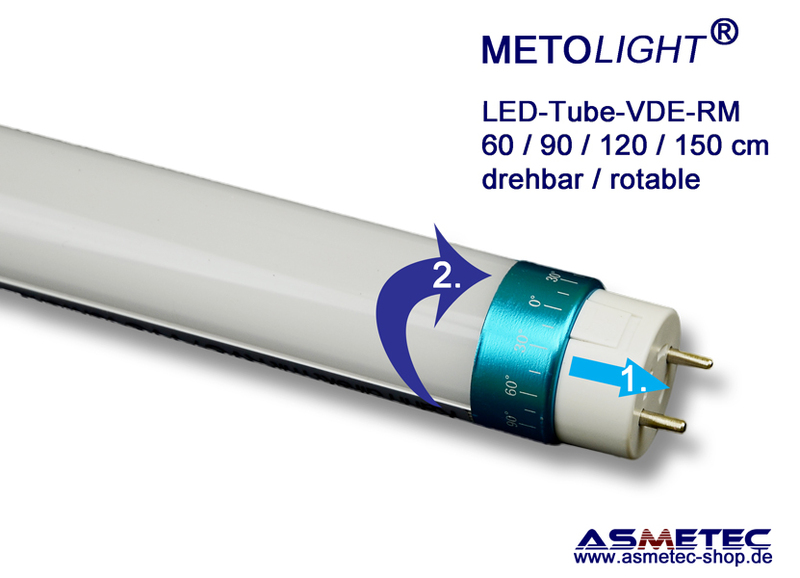 The METOLIGHT-VDE-RM works on all conventional magnetic ballasts as well directly to 230V AC. You only need to replace the existing starter by the special fused LED-starter supplied with each tube. (Asmetec item -no.101495). However luminires with tandem circuit (1 ballast drives 2 tubes) must be checked before. Here it may be that the tube does not light up. The LED tubes are equipped with rotable-fixable sockets so that they can also be used in luminaires with side G13 bases. In addition, the base caps do not increase the tube diameter, which means that the tubes can also be used in luminaires with watertight coupling nuts. The completely newly developed power supply unit with flicker-free technology ensures uniform, fatigue-free lighting. Operation on emergency power systems with DC voltage between 180 and 260 V DC is possible. This LED-tube in light colour 3800-4200K - nature white is ideal for use in offices, shops, work places, hotels, restaurants, bars, indirect lighting etc. Mounted in IP65 luminaires it also can be used outdoor or in fridge rooms. It cannot be used with dimmers and with electronic ballasts. Switch off luminaire - remove old fluorescent tube and old starter - insert fused METOLIGHT LED-Starter and METOLIGHT LEDtube-VDE - switch on - that's it. Each LED-tube undergoes a test routine in our Asmetec-Light-Lab to verify the general function and the main technical data. In addition to this each tube undergoes a 2500 Volt insulation and creep voltage test routine. The tests of all photometric data, ISO-Lines, EMC, switch cycles etc are made for each lot. Customers may receive test reports upon request. Die junge LED-Technik unterliegt einer stetigen Veränderung. LEDs und Treiber werden immer effizienter. Die angegebenen technischen Daten können daher zur Produktverbesserung ohne vorherige Ankündigung geändert werden. The young LED-Technology undergoes a steady development . LEDs and drivers are getting more efficient. The technical data given thus may be changed without prior notice to improve our products.